PINK RIBBON BREAST CANCER AWARENESS BRACELET ... Show your Support and Make a Difference when you purchase these stylish Red Lion Brand Bright Pink Ribbon Breast Cancer Awareness Terry Cloth Bracelets / Wristbands / Ponytailers in 2 Great Color combinations. Support the Cause - a percentage of the proceeds from the purchase of these Pink Ribbon Bracelets / Pony Tails is donated back to Breast Cancer Research. Breast Cancer Awareness Pink Ribbon Bands are Sold (2) per Package (one pair). 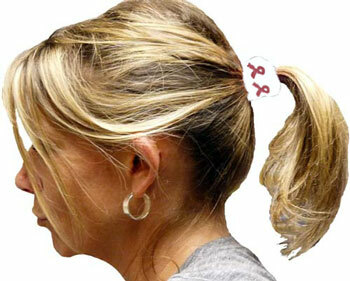 Pink Ribbon Terry Cloth Wristband Bracelets and Pony Tails measure aprox. 1" tall x 3" wide (they will stretch to about 5" wide), are made of Heavy-Weight Plush Terry Pile Fabric, and feature Knit-In Pink Ribbons around the Bracelet ... One Size Fits Most. 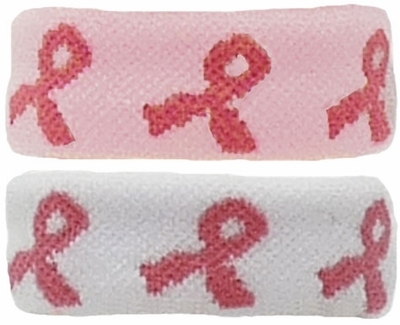 � Pink Band with Pink Ribbons, � White Band with Pink Ribbons.